Thank you to everyone who supported our book week and made it the best one so far. In spite of the snow, we had an amazing World Book Day, with plenty of "Gangster Grannies" and "Demon Dentists" from staff and children. Don't forget that all the children have a World Book Day token they can redeem for a book in any book shop! We had one of our best visiting shows; Oliver Twist, from M&M Theatrical Productions which is inspiring children to read Dickens for themselves, and we have already booked their Lion, the Witch and the Wardrobe for next year! There was a great response to our competitions - especially the "reading in unusual places" photo competition which you can see on our family and friends only face book group. 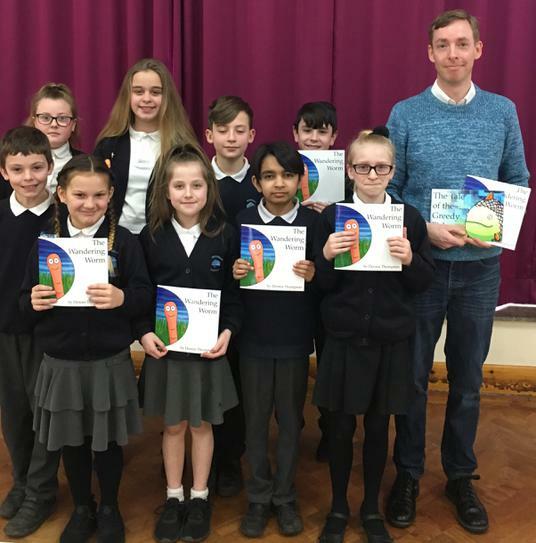 Local author Denis Thompson was unable to come as planned on World Book day as other schools on his itinerary were closed but will be came the following week and inspired children to be writers as well as readers. Special thanks to Miss Stowe and Miss Gouldsmith for organizing the week.